What can be said about Steven Spielberg? He's one of the most famous directors of our time, and you'd be hard pressed to find a single person who doesn't at least know of his existence. Run up to anyone, even some brainless oaf, and say Steven Spielberg - and you can be sure they'll have a rough idea of his work in the film industry. His 1975 hit Jaws launched his name into its own brand, and since then he's become one of the top earners in Hollywood - and his wallet is now increasing as yours (hopefully) empties, for here comes the glorious IMAX rerelease of one of his greatest films yet - Jurassic Park. 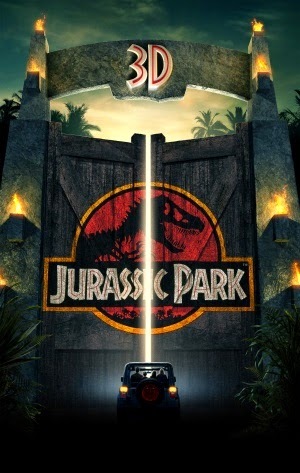 Businessman John Hammond (Richard Attenborough) invites palaeontologist Alan Grant (Sam Neil), his partner Ellie Sattler (Laura Dern) and chaos theorist Ian Malcolm (Jeff Goldblum) to his own Jurassic Park - a controversial amusement park where living, breathing dinosaurs have been resurrected from fossils to serve as public attractions. Their outside opinions are crucial to the park's currently dismal future, but when a power outage sweeps the island, the trouble escalates even further as the creatures begin to rampage and break loose; leaving the visitors battling for their lives against Earth's formerly dominant species. Jurassic Park was well known for its astounding use of computer generated imagery and is generally regarded as the first film to demonstrate its incredible capabilities in blockbuster cinema. There's been no ill effects on the CGI since the film debuted in 1993 - everything holds up beautifully and is made even more stunning in IMAX 3D, which isn't always noticeable but truly brings to life some of the majestic establishing shots and makes the set pieces far more intense. Though it takes over an hour for the epic T-Rex scene to begin and the film arguably features more talking than dinosaurs, it still constructs a beautiful balance between storytelling and action, treating its characters with care and providing a satisfying degree of emotion to what seems like a very odd premise. When it comes to the dinosaur action, it's handled delicately; these are large animals stripped from their time period and they behave as such. There's no silly battles and the dinosaurs do not have sinister intentions - they simply behave as animals defending themselves, dominating humans with their intelligence and superior strength. This renders the action scenes far more tense and unpredictable for first time viewers, and removes any potential corniness from these frightening scenes. Jurassic Park is one of the greatest summer films of all time and its influence on special effects is just one of its many pros - it's always tense and keeps you thrilled but sticks to a tone of adventure of excitement, making it far more attractive for families than many contemporary summer films. The acting throughout is exceptional and the script is rich with character development and a superb overall narrative. Even for those who have seen it countless times, this IMAX rerelease is an exciting cinematic experience and definitely worth a look.